As any parent knows, focusing a three-year-old on any activity requires creativity and perseverance. Imagine if you also had to impart the intellectual, emotional, and social competencies a child will need to thrive in kindergarten and beyond, and you’ll get a sense of what pre-K teachers strive to accomplish every day. Teaching our littlest learners poses unique challenges and opportunities, making pre-K teachers among the most innovative educators. More than 400,000 teachers at 75% of all the K-12 public schools in America have used DonorsChoose.org to create projects requesting resources their students need, and 3 million donors have funded more than 1 million projects since the site was founded in 2000. In the spring of 2017, DonorsChoose.org opened its doors to Head Start teachers across the country with the help of PNC Grow Up Great®. The reach of DonorsChoose.org and the new expansion to Head Start sparked the imagination of the team at Omidyar Network, a key supporter of DonorsChoose.org since 2005. With Omidyar Network’s commitment to advancing innovation in education both in the nonprofit and for-profit sector, and a focused investment strategy in early childhood education, it was the perfect time to expand our partnership. 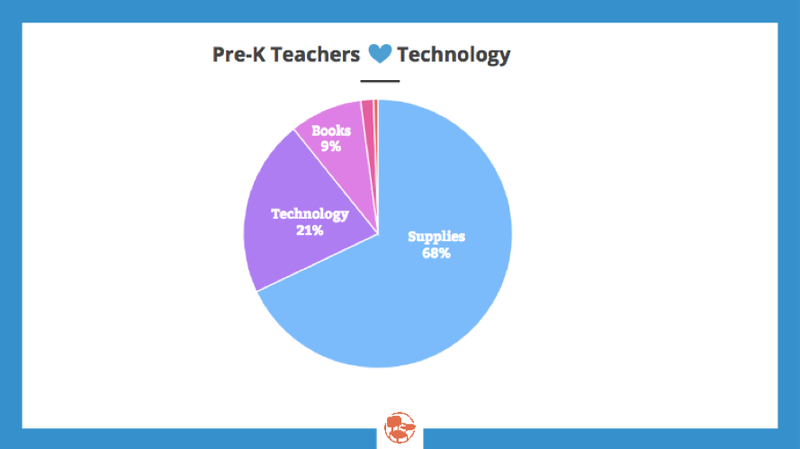 More than 20% of all the projects posted by pre-K teachers requested technology; it was second only to the general category of supplies (68%), which includes everything from construction paper to wooden blocks. 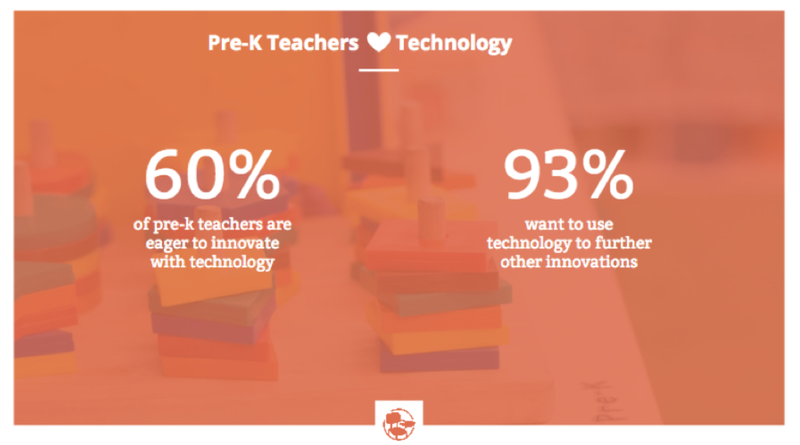 In addition, 60% of pre-K teachers reported being eager to innovate with technology and 93% reported wanting to use technology to further innovations. This appetite to leverage technology by pre-K teachers displayed itself in the Early Learning Innovation Challenge when over 1,000 projects were submitted and funded in a record time. Of note, 77% of schools that received funding through the Early Learning Innovation Challenge predominately serve students from low-income households (Head Start or Title I pre-K classrooms). When you picture a technology-filled classroom, you might imagine students using laptops or tablets. But most pre-K technology requests are for instructional technology — items like projectors or audio recording devices. Pre-K teachers are 23% less likely to request computers and laptops than teachers at other grade levels, and when they do, it’s for different reasons. As an example, Mrs. Ramos, a pre-K teacher in Michigan, created the project “Let’s Put a ‘Little’ Tech in Technology.” In it, she requested tablets, a voice recorder, and a listening center to “give a voice to [her] most quiet students.” Using the tablets, her students are now able to animate an image and record speech so that it appears as if the picture is talking using a student’s voice. Through the listening center and voice recorder, her students can explore stories through audio and even record their own; Mrs. Ramos can “send home sound bites…created by the students,” engaging parents in the in-class technology use as well. Teachers’ response to the Early Learning Innovation Challenge revealed a subsection of pre-K teachers who are leading the way with technology: special education teachers. Three out of the five winning projects came from special education teachers. We’ve seen that special education teachers are pushing to be more innovative, more engaging, and more individualized in their lessons to make sure their students, who often have a wide range of special needs, are kindergarten-ready. Mrs. Carlton’s project exemplifies a larger trend we saw throughout this challenge. More and more, early childhood educators are teaching critical thinking and computer science. And because their students are so young, teachers are not sitting their students in front of screens to accomplish this; instead, they’re teaching the principles of computational thinking with hands-on tools and practices. By laying those foundations, these teachers are equipping their students with the critical thinking and problem-solving skills needed to be successful throughout their education and beyond. The Early Learning Innovation Challenge brought to life over 1,000 projects serving more than 40,000 students primarily from low income households, and the most salient theme of all was simple: when teachers are given the resources they need, children thrive. Charles Best will be joined by Innovation Challenge winners discussing what early childhood teachers want from tech at SXSW EDU on March 6, 11am-12pm CST. Omidyar Network will discuss innovation in the early learning workforce and philanthropy for higher education at SXSW EDU on March 7. Follow the conversation at #innov8ece.